We’ll get a read on how consumers are feeling with Consumer Confidence on Tuesday and the Consumer Sentiment Index on Friday. Thursday’s reports feature Weekly Initial Jobless Claims and the first reading on Q3 Gross Domestic Product. In addition, the Fed’s next two-day meeting of the Federal Open Market Committee begins Tuesday, with the Monetary Policy Statement being released on Wednesday. Investors will be watching closely to see if the Fed fully tapers its ongoing Bond-buying program. This announcement has the potential to create volatility in the markets. When you see these Bond prices moving higher, it means home loan rates are improving–and when they are moving lower, home loan rates are getting worse. To go one step further–a red “candle” means that MBS worsened during the day, while a green “candle” means MBS improved during the day. Depending on how dramatic the changes were on any given day, this can cause rate changes throughout the day, as well as on the rate sheets we start with each morning. 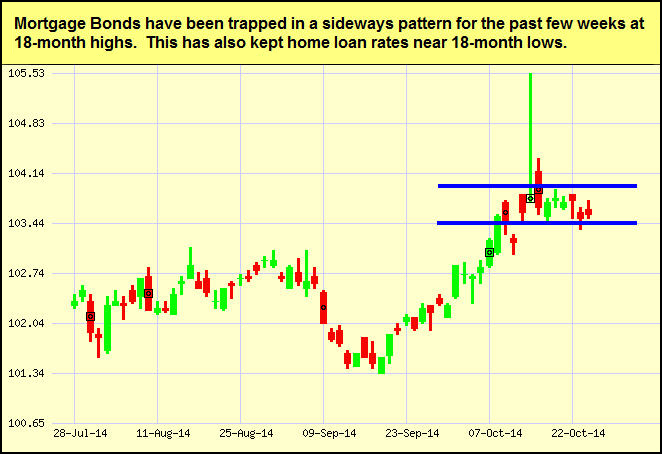 As you can see in the chart below, Mortgage Bonds remain near 18-month highs, helping home loan rates reach 18-month lows. I’ll continue to monitor them closely. Step 1. Understand what you’re interested in. What you already know can put you within short reach of being an expert in your field (if you aren’t one already). This is the least time-intensive route. But if what you’re already doing no longer interests you, you must find something inspiring enough to make learning feel effortless. Step 2. Focus on one thing at a time. Learn too many things at once and you’ll be overwhelmed and probably fail. Don’t move on to the next subject of your expertise until you feel comfortable with the one you’re working on now.